Cold and snowy Ohio mornings always make me crave warm comfort food. Beef Pot Roast is probably the meal my mom made most frequently when I was growing up and something about it always reminds me of my childhood home. The mere thought of a warm, rich, hearty bowl of pot roast is practically nostalgia at its core. I am Ohio born and raised. I spent the majority of my childhood in a small town with lots of farms and livestock fields nearby. My sister were 4H members and I showed our pygmy goats in the local fair. We didn’t have quite the farm experience where there were lawnmower races (as seen in The Prince and Me starring Julia Stiles) but I think it is the closest movie example to some of my childhood midwestern experiences. Beef Pot roast is a classic slow cooker meal that offers a super easy prep. The real rock star is the slow cooker itself. It works magic over a number of hours and transforms the inexpensive piece of meat into a tender fall apart dinnertime meal. I like to prep this recipe before work then set it to low on the slow cooker so it is ready and waiting when I get home. POTATOES! This is a meat and potato meal! It needs the potatoes to be a great pot roast! Making a pot roast really is that easy! Note: I forgot to show where I added the salt and pepper! (I accidentally took a picture instead of the video I intended) No salt and this is a really bland meal. I recommend you season all the sides of your beef roast with salt and pepper, then season the veggies with salt as you add them into the slow cooker. OOPS! I thought I was taking a video! The first non optional ingredient is obviously the beef itself. Bonus, you basically cant buy the wrong beef for this recipe. Today I used a beef chuck roast (it was on sale recently) but over the years we have used shoulder roast, rump roast, or pretty much any inexpensive beef roast (that has not been sliced in steaks) and still ended up with a great pot roast. Using a slow cooker to easily tenderize a less expensive, tough cut of beef can also be a great budget stretcher! As I said in the video, you cannot have a good pot roast without the potatoes. I actually had to run to the store this morning for more potatoes because I forgot why I had the potatoes set aside and made potato soup yesterday with the ones originally intended for todays dinner. OOPS! I am not a morning person but the potatoes are exactly that necessary if you want the perfect pot roast. I used red potatoes today, but most potatoes will work well in this dish. Russet or Idaho potatoes are great, and I think my dad even made this for us a few times with the yellow Yukon gold potatoes. Also optional is a finishing dash of fresh chopped parsley added as you dish up each serving. I forget which guest cook on Rachael Ray said it a few years back, but it is true–finishing slow cooker meals with a touch of something fresh brightens the entire meal. Plus since we all eat with our eyes first, this tiny addition makes the whole meal look even better! There was a joke growing up that if my sister or I made soup before a snow storm then my dad (the superintendent) would have to cancel school the next day. I can assure you that any cancelling of school was completely coincidental and 100% weather related 🙂 Nevertheless soup was always fun. My Dad was always the ‘Chili’ maker growing up. It always had tomatoes and ground beef, sometimes had beans, and never had onions or peppers. Mine is a bit different. I think I first made chili for myself in college on a cold snow day. I learned with the chili seasoning packet spices just like Dad. As I began using more jared spices in my mid twenties, I realized that I was already stocking all of the spices typically found in those seasoning packets. Several years and quite a few batches of chili later, I have come to love this great mild Chili that is hearty, versatile, and super easy to make. The only fresh ingredients needed to make a great chili are onions and jalapeños (and the jalapeños are optional). Everything else is super easy to keep on hand between the pantry and freezer. I like to stock up on the various canned tomato products when they go on sale. Just last week I was able to buy the 14.5 ounce canned tomatoes for just 0.69 cents per can! I do the same with the ground beef. I combined a good sale with coupons and was able to get five packs of the ground beef for just $4.49 each. Pull the cans from the pantry and the beef from the freezer when you are ready to try this recipe! You need only a few spices: Chili Powder, Cumin, Garlic Powder and Cayenne Pepper. Plus salt. As is the name of the dish, the Chili Powder is the most used of these. Despite the name and the amount used it won’t actually make a super spicy stew! The Cayenne Pepper helps add a bit more spice too. I prefer my spice level relatively low, just enough heat to make my nose run by the end of a hearty bowl (sorry if that is TMI). The cumin brings a bit of another spice element, combining with the meat/beans/onions to make you think you are eating a bit of tex-mex. And I have found that onion powder is easier to control than fresh garlic cloves when it comes to a good chili. The only real prep is giving the onion and jalapeños some rough dicing. I used a mid size yellow onion that was about 2/3rds pound. The three jalapeños came in at 1/5th pound before I cut the stems off and removed the seeds and ribs. You can use more jalapeño, not remove the ribs and seeds, or choose a spicier pepper to get more heat. The easiest way to remove the seeds and ribs is to firmly peel it out with a spoon. Then to dice, I recommend you first julienne the pepper longways (make long thin strips or match stick size pieces) then cross cut to dice. The chili transforms somewhat quickly once we start adding ingredients into the soup pot. Start with about 1 Tablespoon olive oil, the diced onion, and medium heat. Stir the onion frequently. Our goal is to merely soften the onions, not brown them. Four or five minutes into this add all of the jalapeños and keep stirring. Once the jalapeños start softening it is time to get all of the spices into the mix. The heat will give the spices a slight toast and help infuse their flavors into the entire dish. Stir to combine and let the heat wake up the spices for just a minute or so. My secrets for the thick texture I like is to add the beef stock then add the ground beef uncooked. Also, instead of a spatula to break down the meat I use my potato masher. This combo almost dissolves the ground beef into the stew as it cooks and really thickens the Chili. Yes, dissolving meat in broth sounds terrible, but you have to trust me here. This will be a great texture! The best mainstream comparison I can offer is that of Cincinnati Style Chili, AKA Skyline or Gold Star. Note: I am not finished yet! We still have the tomatoes and beans to add! Get ready! We are almost done! I add tomato paste (rich and thick), a double can of crushed tomatoes (super thick texture), tomato sauce, and diced tomatoes (bigger pieces add texture). If you can find them, I like to use at least one can of fire roasted tomatoes. I think the hint of smokyness adds that something something to the finished product. If using canned beans take a moment and rinse the beans before adding to the stew. I swear something about the cloudy water and bean funk at the bottom of the can changes the flavor if you let it in the dish. It is also a habit I started because dozens of other recipes recommend it too. If I have more time I do like to soak my own dry kidney beans. When I do this I always make extra and keep some in the freezer. Here is the hard part. We need to let the mix simmer and reduce a bit to thicken up a bit more. The chili smells so good and tempting already! It still needs some time and taste testing though. The picture on the right shows just how thick I like my Chili. I think a really good Chili should be like a thick meat stew that can really be piled high! Also, you may have noticed the lack of any salt being added thusfar. I love soups of many kinds and adding too much salt can quickly ruin an otherwise great soup. I am especially conscious of this when using so many canned items simultaneously. I taste test while the Chili is simmering and add salt to taste, plus check on the other spices levels too. I needed two tablespoons salt today (note, the double can of crushed tomatoes was salt free). The versatility of this semi mild chili can really be shown in the way you serve it. This Chili can be served on top of french fries/baked potato/pasta/Macaroni and cheese. You can top it many ways, including but not limited to diced avocado, extra jalapeños, cheese, sour cream, oyster crackers, or guacamole. Or you can serve it as is next to a grilled cheese or peanut butter sandwich. There are so many different combos you can make! Today I served it with some al dente bucatini pasta, a dollop of sour cream, and a sprinkle of cheese. Dad almost always served his Chili with peanut butter sandwiches or cheese and oyster crackers. Pro tip: dipping a PB sandwich into the chili is an odd yet satisfying sweet/salty/spicy combo that just seems to work! Happy Chili making! I hope this recipe helps warm up your snowy winter days! Perfecting a Roasted Chicken is one of the easiest and always affordable ways you can impress someone that comes over for dinner. 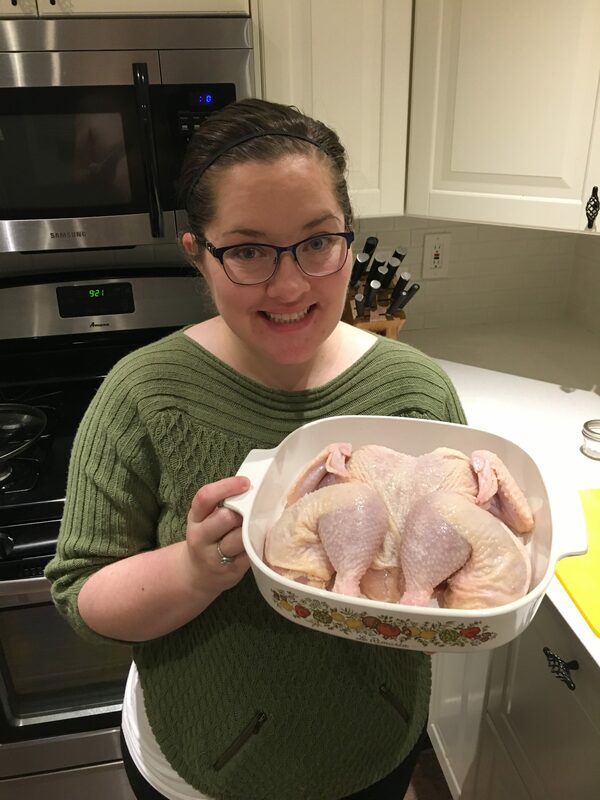 Let me tell you, I cannot count how many dry or rubbery or otherwise ill-prepared chickens I fed my husband trying to teach myself how to make a traditional chicken roast or a crock pot chicken recipes.  It was many. The one technique that has worked for me 100% of the time is a Dry Brine Spatchcock Roasted Chicken. Dry-Brine and Spatchcock are two separate techniques that will help you create one of the most delicious birds you have ever encountered. I can almost guarantee you will want this recipe again and again! The Dry Brine is essentially a salt brine method where you salt the meat directly then let time work magic while the meat rests for 8-24 hours in the fridge. You will skip the liquid part of traditional brining which will prevent potential salmonella contamination in your kitchen. You can also use smaller quantities because there is no water to dilute the flavoring. I first showed you an easy dry brine in my yummy Basic Pork Belly Roast recipe from this past January. Now we are ready to add the salt! You will want to apply the salt both on and under the skin on both sides of the chicken. For a typical 3-4 pound chicken, I use one (heaping) tablespoon of salt, plus a touch more right before baking. My hubby eyeballs the salt completely when he makes this for me. I try to get the salt evenly spread thru the entire chicken. I can most effectively do this when I keep a ‘wet’ and a ‘dry’ hand. I use the ‘wet’ hand (my left) to lift the skin and the ‘dry’ hand (my right) to add the salt. It will seem like a lot of salt, but please trust me that this will be one super yummy chicken! Make sure to reserve some salt for the outside of the chicken. Once I have most of the salt distributed as evenly as I can under the skin, I take a moment and give the chicken a quick massage. Yes, I massage the chicken. At this point, the salt is still grainy. The quick massage gives me one more opportunity to spread the salt under the skin before the brining process really begins. Put most of the salt under the skin, and keep a smidgen, say less than a teaspoon worth, to salt the outside of the chicken (including the innards part facing down and the skin facing up). We do want the skin to dehydrate a little because it adds to the making of crispy skin! Now, we are ready to cover the chicken and let it brine away in the fridge! I have brined first thing in the morning and cooked it that evening for dinner, but most commonly I start a chicken brining just before bed and cook it the next evening! Compound butter is an absolutely delectable way to add that extra something something to this meal. My favorite herb to add to this chicken is a rosemary; Italian seasoning would be a close second fav. The butter helps ensure the chicken is not only tasty, but also juicy! Compound butter is super easy too! So easy in fact, it is literally just an herb of your choosing, plus softened unsalted butter! Note: because the chicken has already been salted during the brine process, you do not want to use any kind of herb mix that would add more salt. I think a two part butter to one part dry herb works really well for this chicken. Sometimes during the summer I will use fresh rosemary from my garden. If I do use fresh, I reduce the amount of rosemary to about 1 1/2 teaspoons (or roughly half a tablespoon) because the flavor potency of a fresh herb is much more robust. When your compound butter is well mixed, it is ready to add to the chicken! Just like when we salted the chicken to start the dry brine process, we want to apply the majority of the butter under the skin. Our goal is for some of the compound butter to reach as much of the chicken as we can get it to. My next tip to ensure this? Give you chicken another quick massage! This will, like with the salt, help ensure the compound butter reaches the nooks and crannies. It also has the added bonus of getting a bit of butter ontop of the skin. Lastly, we want to add that quick pinch of salt and we are ready to put the chicken in the oven. Reminder: The major benefit of the spatchcock chicken is it can lay flat so it will roast up quickly and evenly. We want the oven to be preheated to a toasty 425 degrees and will bake the chicken for 45-55 minutes. I always double check the chicken with a meat thermomoter in the thigh and the breast to at least 165 degrees internal temp. 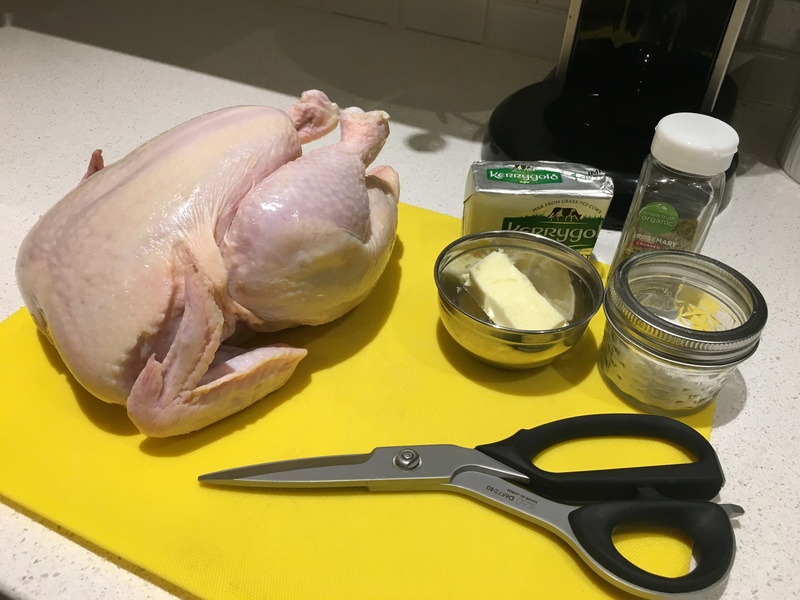 Despite the wordy article, I hope you can see how easy and how achievable this chicken is for you to prepare and impress with! Please let me know in the comments below how it turns out for you! Loosen the skin from the meat without removing the skin. Sprinkle remaining salt on outside of the chicken (including skin and innards bottom side).